Twenty-four high school seniors from the ranks of Drum Corps International units have been selected as members of the 2010 All-DCI Color Guard. Representing 16 corps and 13 states, ensemble members will perform as part of the halftime show for the U.S. Army All-American Bowl in San Antonio, Texas on Jan. 9 at the Alamodome. The standout color guard performers will complement the 97-member U.S. Army All-American Marching Band during a five-day series of rehearsals, events and performances. Together, members of this elite marching ensemble will showcase their talents at the bowl game which is the country's premier high school football event. "It is such an honor to be picked out of a number of other applicants for the 2010 All-DCI Color Guard," said Sara Johnston, a senior at South Lyon, Mich. High School and a three-year member of Legends Drum and Bugle Corps. "Having the opportunity to be with other fantastic performers will be a very fun experience." 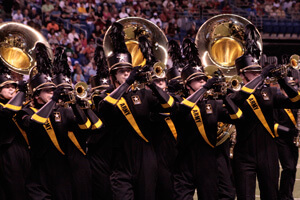 Spearheaded by the National Association for Music Education (MENC), and New Jersey-based sports marketing and event management company SportsLink, participation in the U.S. Army All-American Marching Band has become one of the top honors for high school marching musicians and a premier educational experience. In just the third year of the All-American Marching Band, MENC received more than 1,300 nominations for less than 100 spots available to high school seniors across the country. Members of the 2009 All-DCI Color Guard. "I was speechless to hear that I got picked to be in the All-DCI Color Guard. It's a complete honor and has already taught me that if I try hard enough for something, I can accomplish it," said Xavier Velasco, who has spent the last two summers as a member of the Madison Scouts' color guard. Receiving the same honors and treatment as their football-playing counterparts, band and color guard members will be flown into San Antonio on Tuesday, Jan. 5 to begin rehearsals. In a matter of days, the marching ensemble will learn and perfect a six-minute production for the halftime show. Color guard members were chosen specifically for their participation in Drum Corps International groups and represent a diverse cross-section of corps membership. The experience will give these individuals a unique opportunity to perform with their peers outside of DCI's competitive realm. San Antonio with the All-American Marching Band. in performance at the Alamodome. All-DCI Color Guard members will be instructed by Tim Newburn and Ronnie Bynum. Newburn is the color guard director for the Langham Creek and Cypress Ranch High Schools in Houston, Texas. He has worked with countless drum corps programs over the last 15 years including the Blue Knights, Glassmen, Bluecoats and Phantom Regiment. Bynum, who is a staff member with the Center Grove High School Marching Band, from Greenwood, Ind., has served as color guard caption head for the Cavaliers outside of his full-time job working with at-risk youth in collaboration with the Indianapolis Public School system. The 2010 U. S. Army All-American Marching Band will be directed by Nola Jones who in addition to her position as Director of Bands at the University of Tennessee Martin, serves as a Drum Corps International adjudicator. This year's All-American Bowl game will be nationally televised on NBC on Jan. 9, 2010. The marching band halftime performance will be Webcast via AllAmericanGames.tv, along with a dress rehearsal from 6 to 8 p.m. CST on Friday, Jan. 8. Until then, color guard and band members alike will be waiting with anticipation for the New Year. "I can't wait for my school to recognize me for all the hard work that I have done," said color guard member Will Levek who completed his first year as member of the Blue Knights in 2009. "I even told all my friends to watch for me on TV!" For more information on the U.S. Army All-American Marching Band, the U.S. Army All-American Bowl and its related events, visit USArmyAllAmericanBowl.com, MENC.org and GoArmy.com. Photos courtesy MENC.